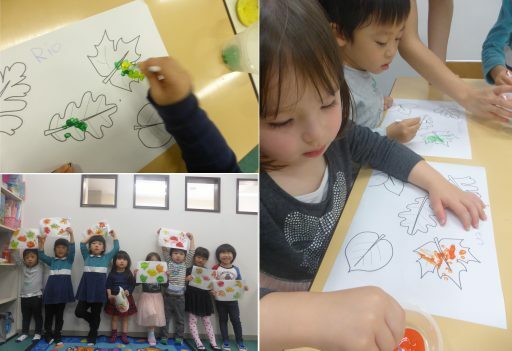 Blog "Developing Fine Motor Skills with Falling Autumn Leaves"
For this month autumn theme we let the preschool kids color falling leaves by using Q-tips and paint. By using Q-tips to color with, this activity helps them to develop fine motor skills in their hands and fingers. This skill will further help them using eating utensils, buttoning their pants, zipping up their coats and they will also have a simpler time learning how to write. They could choose between green, red, orange and yellow paint to color their falling leaves with. The kids had a lot of fun using their creativity coloring in different ways such as making dots, stripes or mixing the colors with each other. Each of the crafts turned out beautiful and unique just like real autumn leaves.